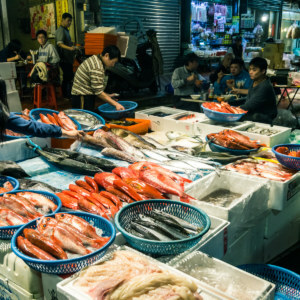 In the summer of 2014 I was nearing the end of my first sojourn in Taiwan. By the beginning of August I would be in Canada for a wedding in the family with no idea what I’d be doing after that. 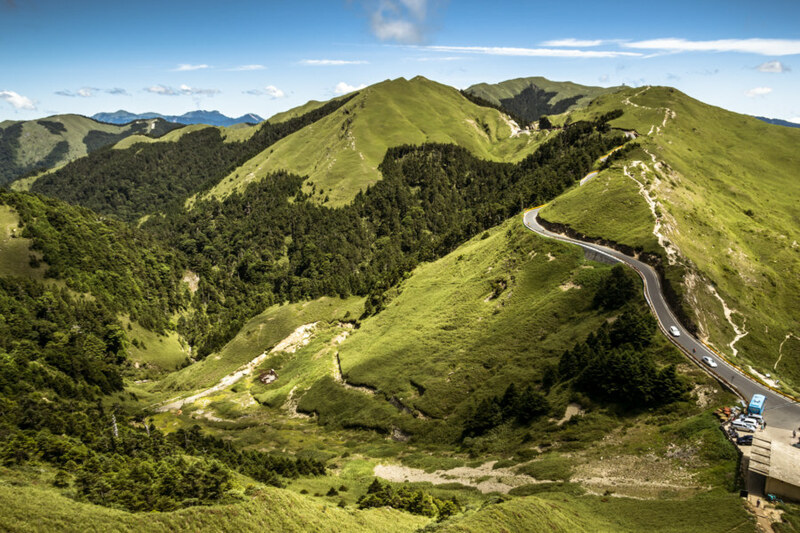 Since I wasn’t sure if I would be returning to Taiwan I made vague plans to go on a road trip. With only about a week to go before my departure the weather took an ominous turn as Typhoon Matmo 麥德姆 barrelled toward the island. 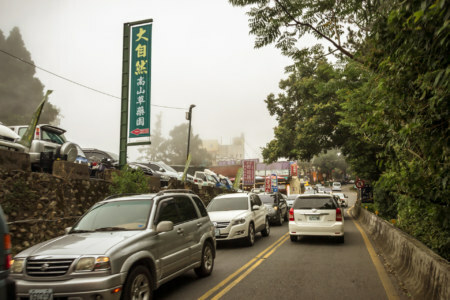 On July 20th, with the pressure of time bearing down on us, my girlfriend and I hopped on a 125cc scooter—the same kind of dinky, puttering scooter you see people riding around any Taiwanese town—and set out from Changhua 彰化 with the goal of crossing the Central Mountain Range 中央山脈 at Wǔlíng 武陵, the highest paved (and publicly-accessible) mountain pass in Taiwan at 3,275 meters above sea level. 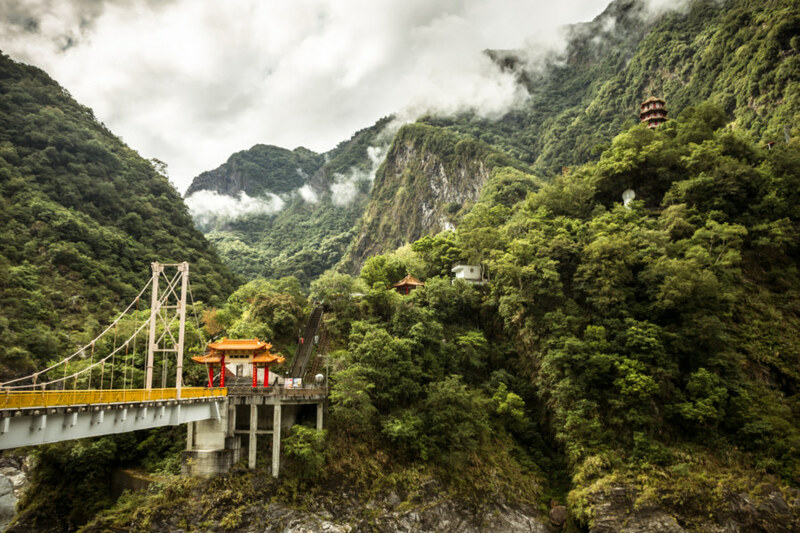 With luck, time and weather permitting, we’d be able to visit Héhuānshān 合歡山 and maybe even drive down into the amazingly scenic Taroko Gorge 太魯閣峽谷 on the east side of the island. A fancy hotel on the way to Qingjing Farm. 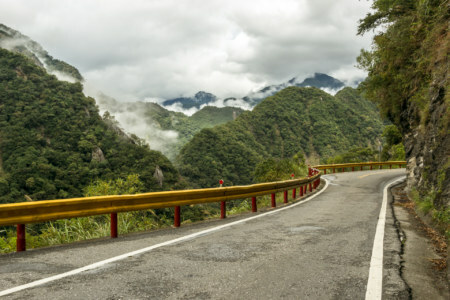 Having already explored much of western Nántóu 南投 we sped along Provincial Highway 14 and passed through Pǔlǐ 埔里 without making any major stops before Cingjing Farm 清境農場 (pinyin: Qīngjìng), one of Taiwan’s most popular attractions. 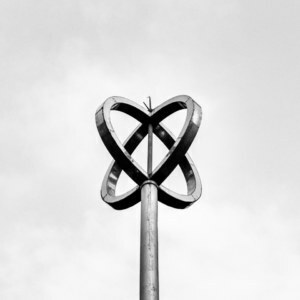 Prior to visiting I had already formed the prototypically western attitude toward the place. Alright, it’s a farm. So what? Of course, such farms are not out of the ordinary where I’m from—all it takes is a half hour’s drive into the countryside in any direction and you’re bound to see sheep on any number of farms in the rural Ontario1. Whatever the case, East Asian tourists seem to absolutely love the farm2. Something about the high mountain landscape, the woolly sheep, and all the faux European buildings make the place look like an ersatz Switzerland, oddly out of place in this tropical land yet irresistible to the the incredible number of tourists who clamber up from the valleys below to check-in at what is, at 1,740 meters, apparently the highest Starbucks in Asia. The traffic heading into Qingjing Farm is intense. A constant crush of group tour buses near the farm. Rather than pay the entrance fee to the farm itself we milled around outside to observe the spectacle: the constant traffic jam of mammoth tour buses plying these narrow, winding mountain roads; the creative fashion sense and extraordinary volume levels of the many groups of Chinese tourists meandering through the roadside marketplace; the hysterical reactions of children racing around woolly sheep placidly mowing the part of the hillside visible from the parking lot. 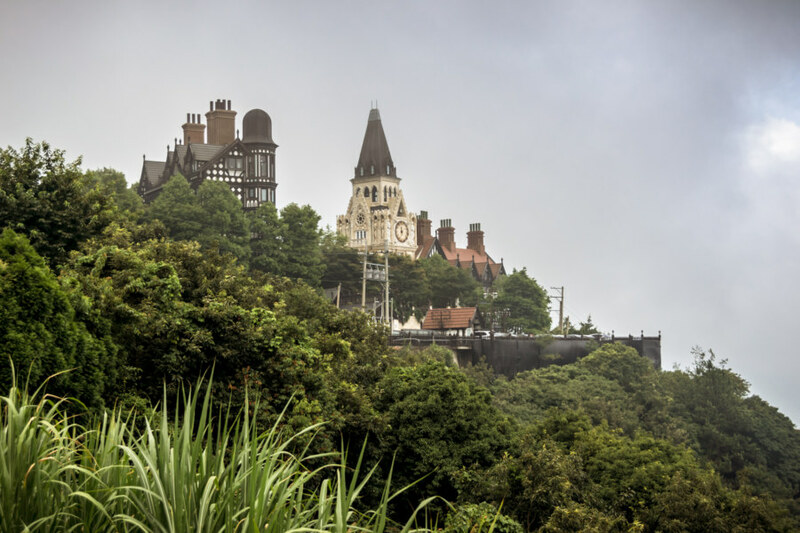 It was everything I love to hate about overdeveloped tourist attractions in Taiwan3. Needless to say, riding a scooter along this stretch of highway requires patience and care, particularly on weekends. Mountainside farms on the way to Hehuanshan. Beyond the farm traffic on the road began to thin out and the drive became pleasurable again. With another kilometer and a half of elevation to gain it was, at times, slow going on that scooter—but going slow allowed us to appreciate the absolutely stunning scenery. 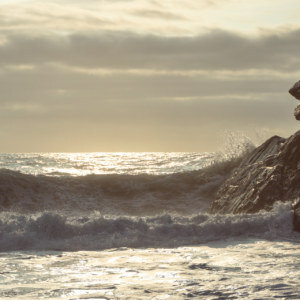 In fact, it was so stunning that at one point we nearly launched ourselves over the cliffside—and I suffered a nasty scrape on my bare leg after being dragged along the guard rail a ways. Lesson learned: pay attention to the winding road, dummy. 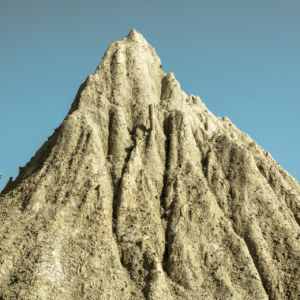 A thin notch in the mountainside is all that saves us. Getting vertical on the way to Hehuanshan. The cloud formation to the right rose out of the valley below like the head of a serpent and soon shrouded the road in mist. Riding above the clouds was an amazing experience. There seemed to be no end to the diversity of forms roiling around the highway as we continued to gain elevation. Wispy tendrils traced the shadowy contours of the surrounding topography in the deepening afternoon. Stopping to look over the edge we often saw valleys filled with what looked to be lakes of cotton candy. 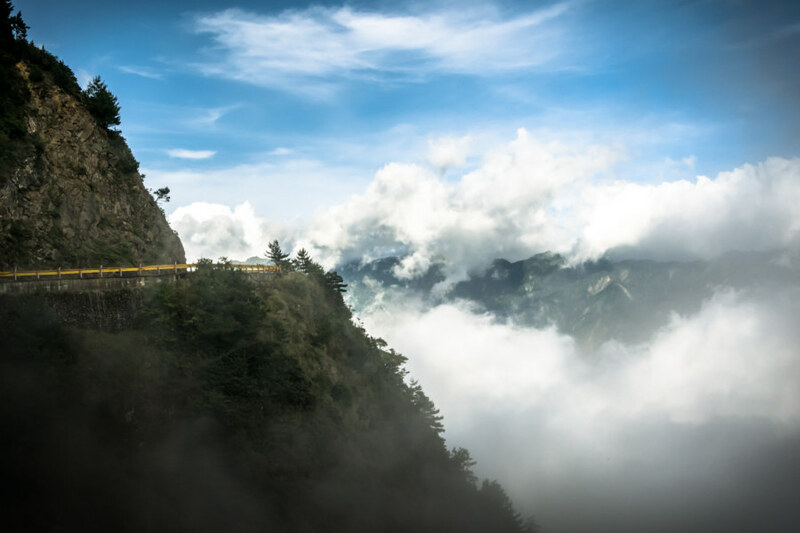 At one point we stopped to watch a vertical sheet of cloud rise along the cliffside to our right, an ethereal emissary from unseen kingdoms in the valleys below. 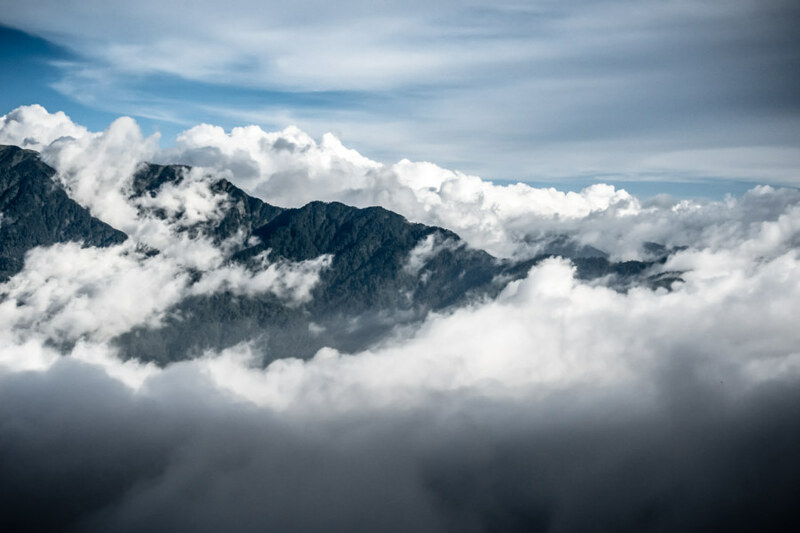 At other times we plunged into the clouds themselves, visibility dropping to mere meters, before snapping back into the clear mountain air without warning, vivid blue skies opening up once more. 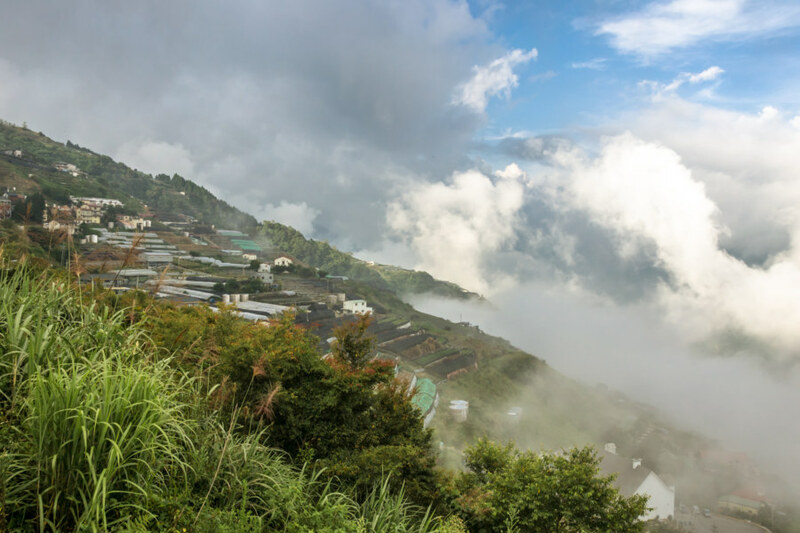 High in the Central Mountain Range of Taiwan. 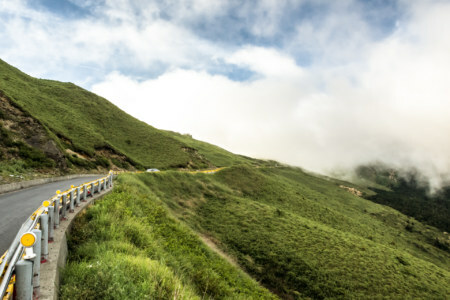 Riding through the high mountain country of central Taiwan. Dark mountains in an ocean of clouds. At some point we crossed an ill-defined threshold and those blue skies gave way to an ever-present grey fog. Light bled out of the sky and strong winds began to blast us from every direction. 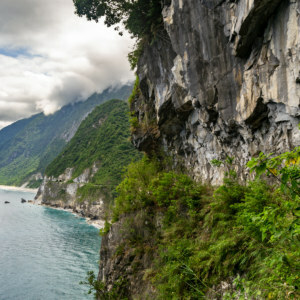 We must have crossed Kūnyáng 昆陽, the official entrance to Taroko National Park 太魯閣國家公園, though I don’t recall seeing a sign. We didn’t see much apart from the occasional rocky outcrop as we swung around another bend in the road. All was lost in the interminable mist. 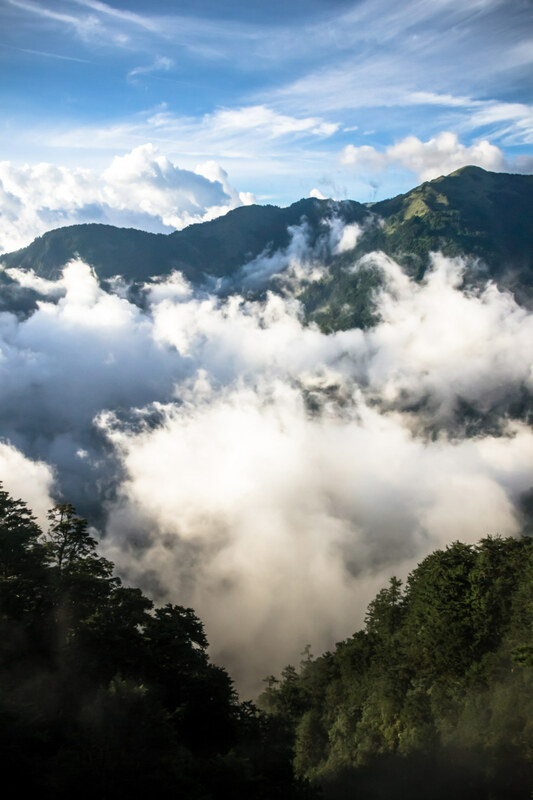 High above the clouds in the central mountain range of Taiwan. Entering the alpine highlands. Not long after this we entered the cloud layer and visibility dropped to nearly zero. Finally made it up to Song Syue Lodge, the highest hotel in Taiwan. I knew we had to find a place to stay as night began to fall but hadn’t done much advance research. This trip was very much about going with the flow and relying on real-world (rather than digital) senses to get around and make decisions. And so it was with a sense of relief that I spotted a sign for the Song Syue Lodge 松雪樓 (pinyin: Sōngxuělóu, literally “Pine Snow Building”) along the highway. We stopped, checked prices and availability, and decided to stay. Setting out the next day from Song Syue Lodge. Most of these tourists are bussed in and just wander around the lodge and nearby visitor’s center. After a fitful night of rest it was decision time: venture into the gorge or turn tail and head back down to the western plains? I consulted weather forecasts and it didn’t look as if the typhoon was going to strike for another two days. I reasoned that we had enough time to at least check out the upper reaches of the gorge that I hadn’t seen on my round-the-island bicycle tour the previous year. 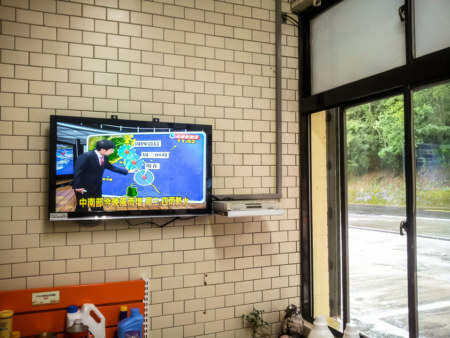 The main source of uncertainty was whether the park would be closed for the typhoon—and at what time—but we also knew that finishing the ride in Hualien 花蓮 and shipping the scooter (and ourselves) back to Changhua by train was also an option. With this contingency plan in place we decided to go for it. 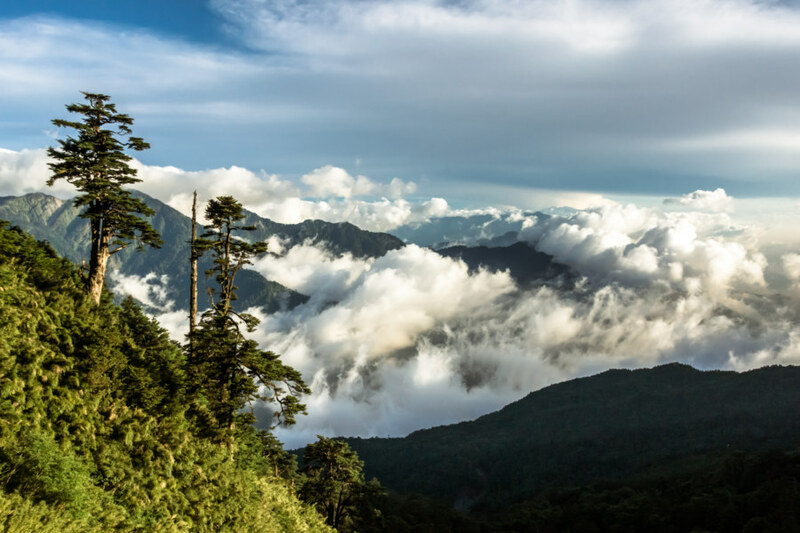 A fantastic view from one of the peaks of Hehuanshan. 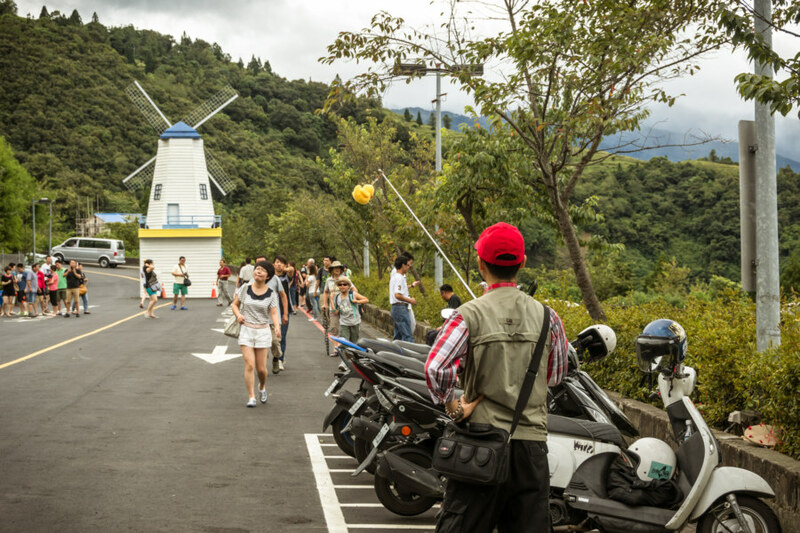 Hehuanshan by day was another tourist zoo—but nowhere near as bad as Cingjing Farm. 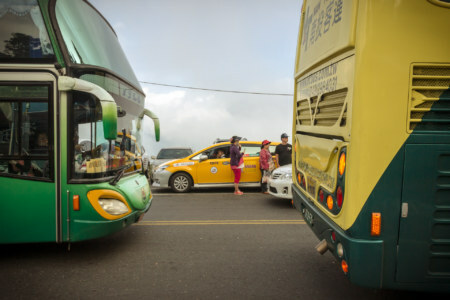 Huge convoys deposited busloads of tourists near the visitor’s center but few of them seemed inclined toward hiking up any of peaks within easy reach. 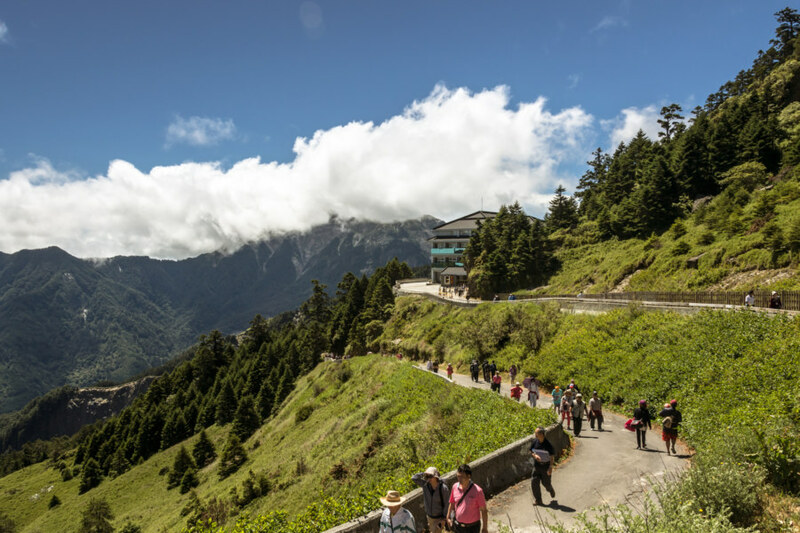 Not wanting to waste too much time around Hehuanshan we followed the nearest trail—possibly the “summit peak” trail—and enjoyed a great view before hitting the road again. 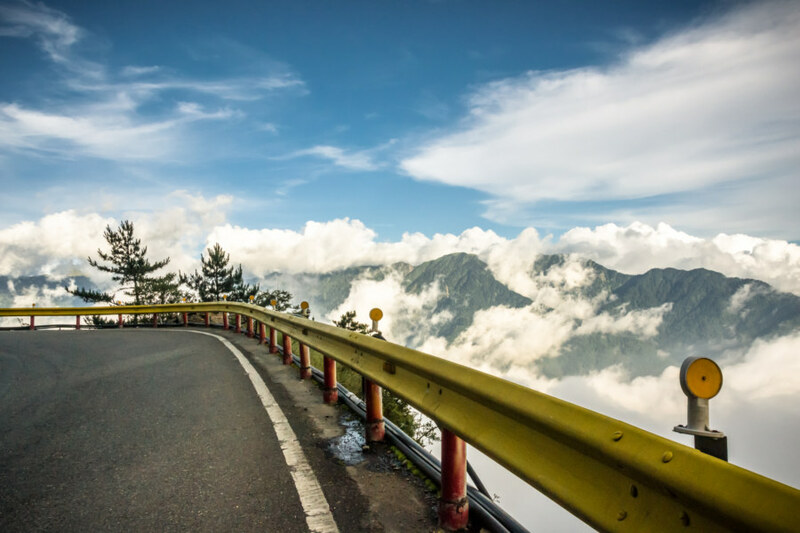 There wasn’t very much traffic on the road beyond Hehuanshan. 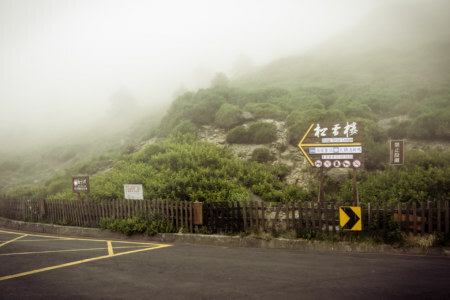 Perhaps due to the threat of the oncoming typhoon there weren’t many vehicles on the road beyond Hehuanshan. Needless to say, the views were extraordinary, and we made frequent stops to savour the scenery. 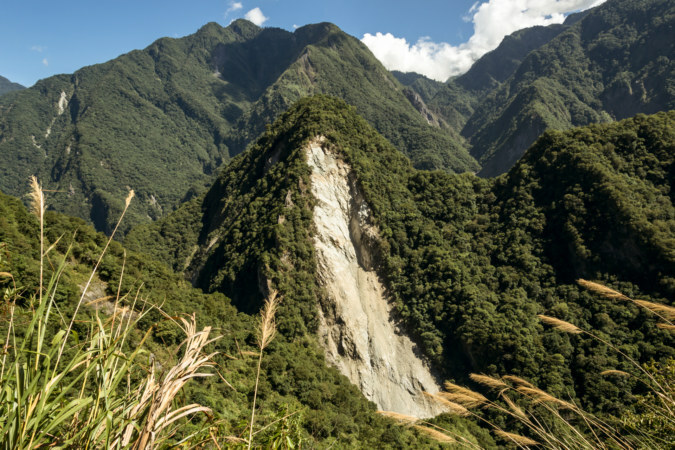 This part of the central range is largely above the tree line, though I’m not entirely sure if this is due to low temperatures (Hehuanshan is known for snow in wintertime) or strong winds (as it is in Yángmíngshān 陽明山 on the outskirts of Taipei 台北). Tree lines are usually the product of multiple factors but I would bet on wind being one of the most important up here at Hehuanshan; you can see in some of the photos that eastward-facing slopes are often more denuded than those facing west (which would be more sheltered from the prevailing winds from the east). 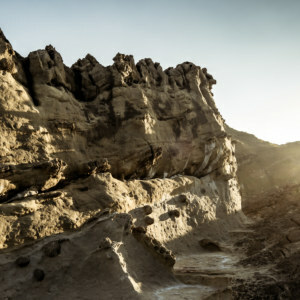 A notch in the cliffside is where you’ll soon find yourself. 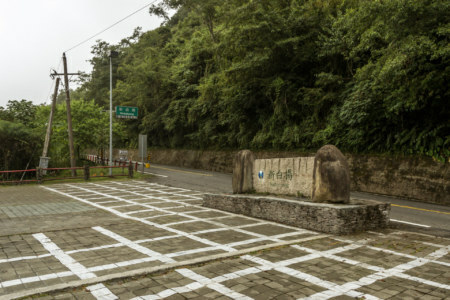 Before long we reached the Central Cross-Island Highway 中部橫貫公路, one of only three highways connecting east and west Taiwan, a fact that fills me with wonder5. Dropping down into the gorge we continued along winding cliffside roads, skittering down the gravity well, grimly aware of the potential for landslides to sweep us into the abyss at any moment. Safety warnings are frequently seen while tumbling down the thin asphalt ribbon leading to the sea. Beware of falling rocks! 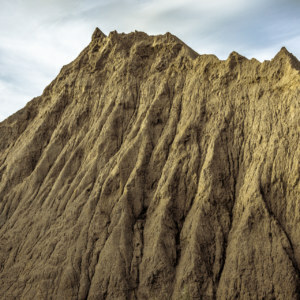 Evidence of landslides can be seen throughout the park. 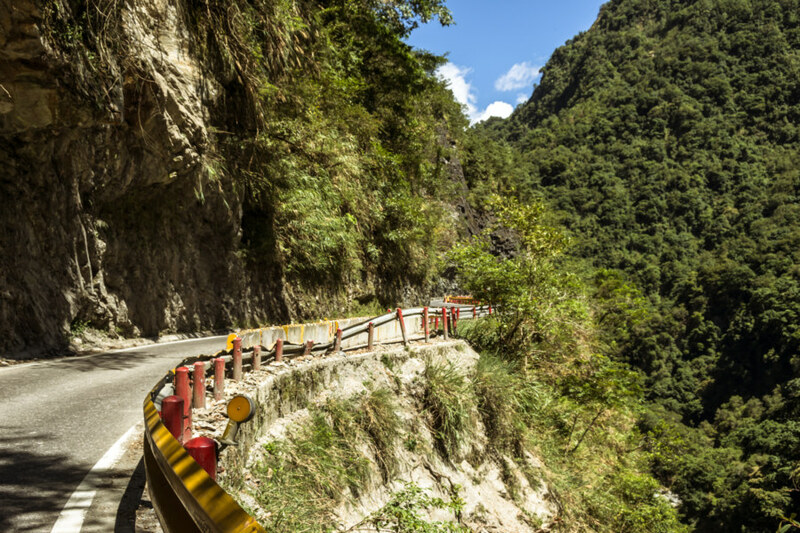 Trucking through Taroko Gorge. This is one of the only east-west highways across the central part of the country, believe it or not, and people do ship things this way. 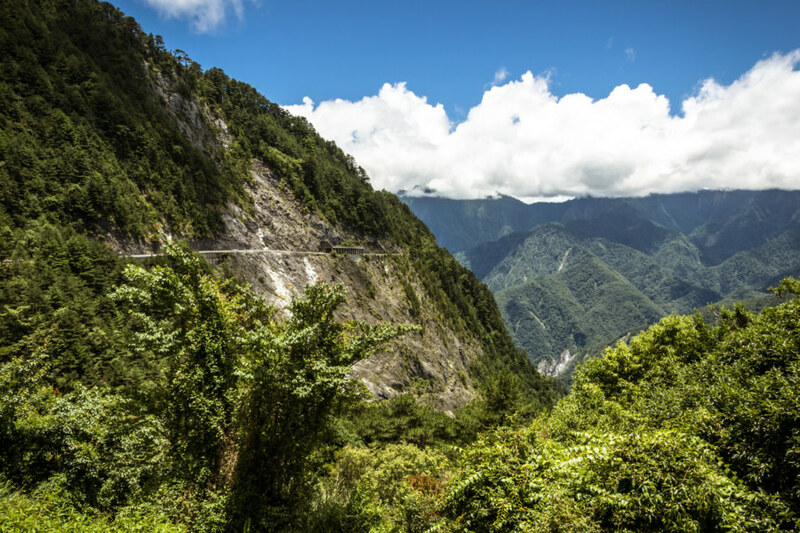 There aren’t too many places to stop in the upper reaches of Taroko Gorge but you’ll see fruit stands selling local produce now and then. Most of these will be operated by local indigenous people if I’m not mistaken. You can see the highway winding along the mountainside at the bottom right of this photograph. Here we are tracing the contours of a incredibly rugged landscape. 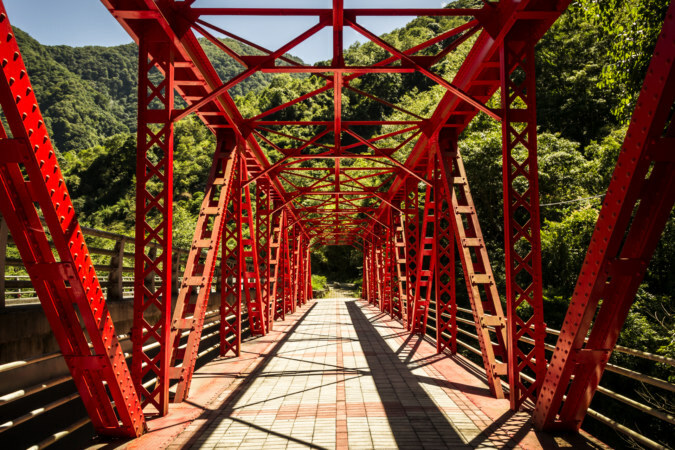 One of many old bridges in Taroko Gorge. 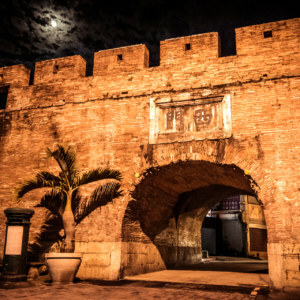 This one is no longer used but has been left here for tourists to wander over and check out. 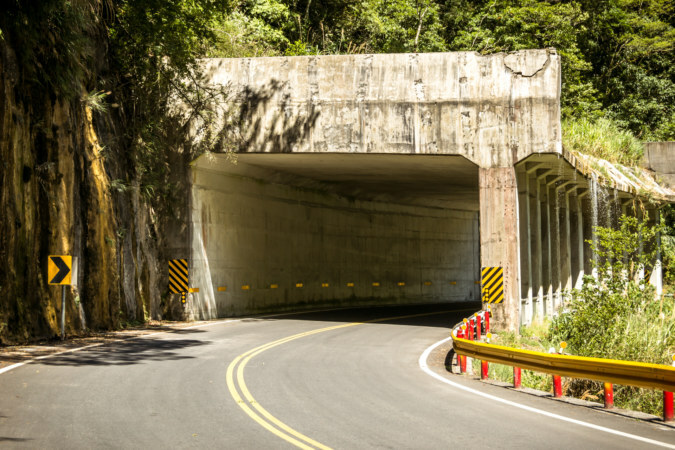 This tunnel is a reinforcement against landslides. Particularly vulnerable slopes have these setup all along the highway as it dips deeper into the gravity well. 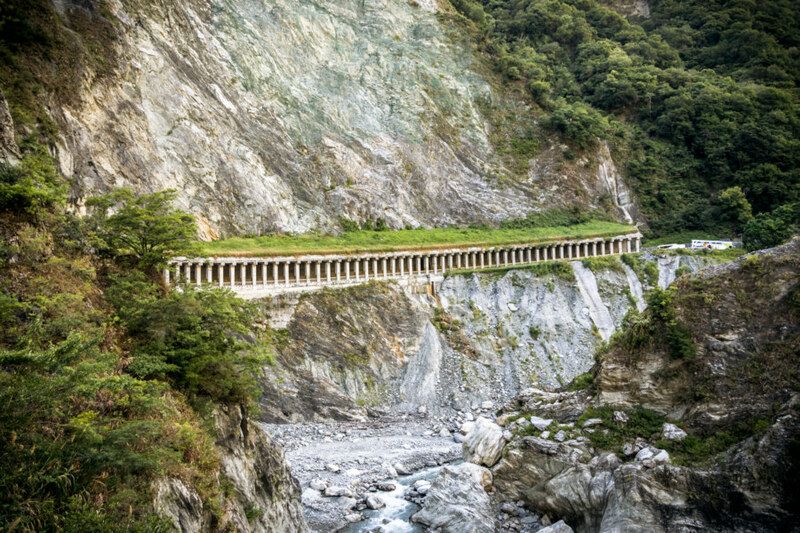 Deeper into Taroko Gorge we go. One of many landslide scars visible as you come down out of the mountains. 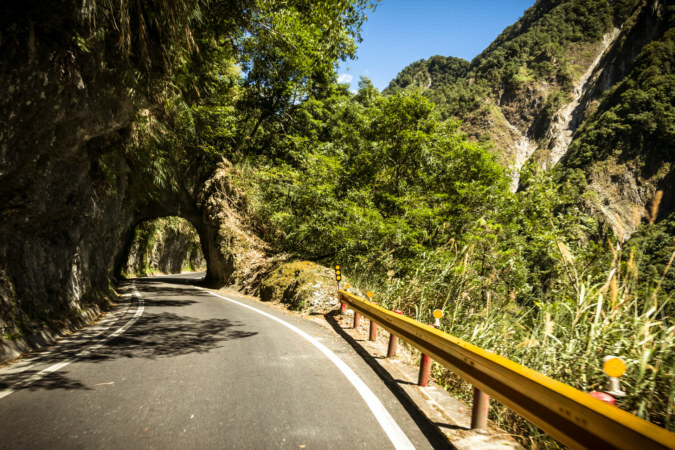 Slipping through one of many tunnels in the winding road through Taroko Gorge. 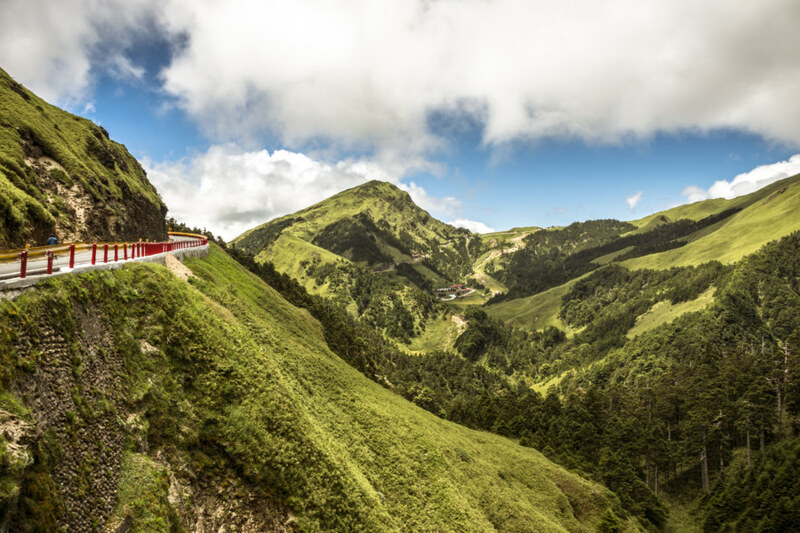 With such fine weather it was hard to resist the allure of heading all the way down to Tiānxiáng 天祥 (elevation 480 meters above sea level) and spending the night at the China Youth Corps Activity Center, the same place I stayed on my round-the-island bicycle tour. And so that is precisely what we did—but not before stopping off to check out the Baiyang Trail 白楊步道, which I had also visited the previous year. 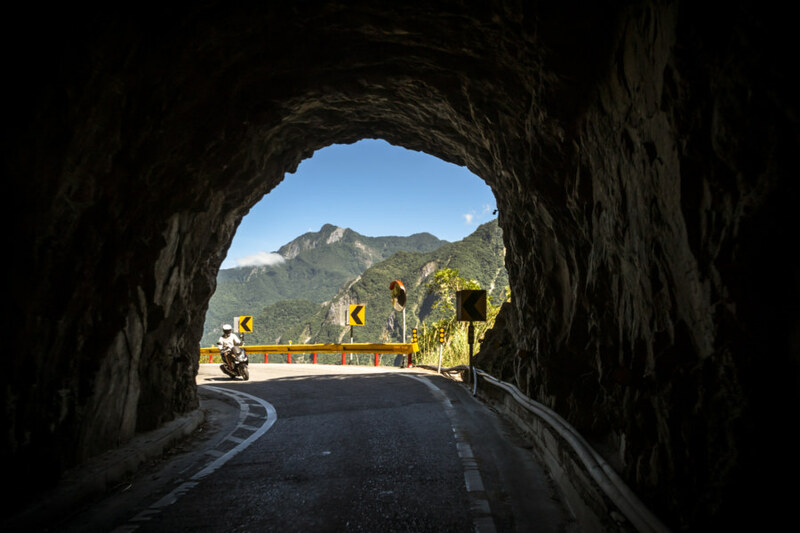 The long landslide tunnel just outside of Tianxiang. 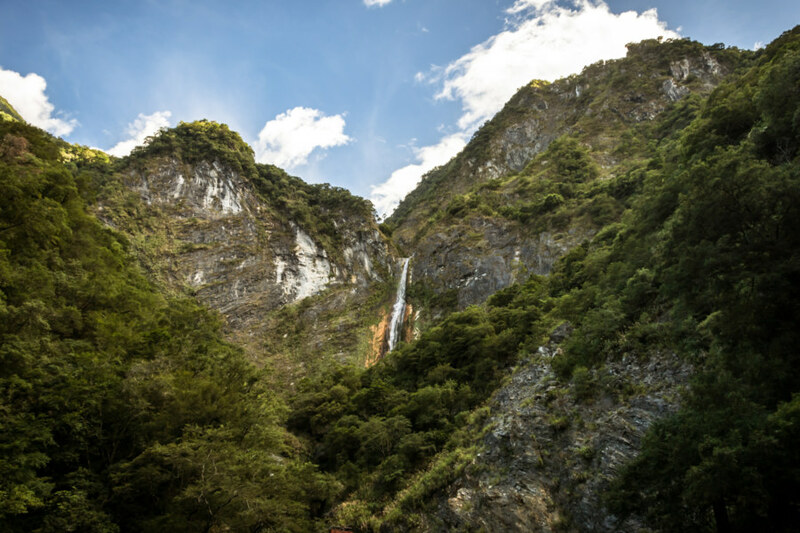 The pathway to the Baiyang Waterfall Trail is hidden inside here. 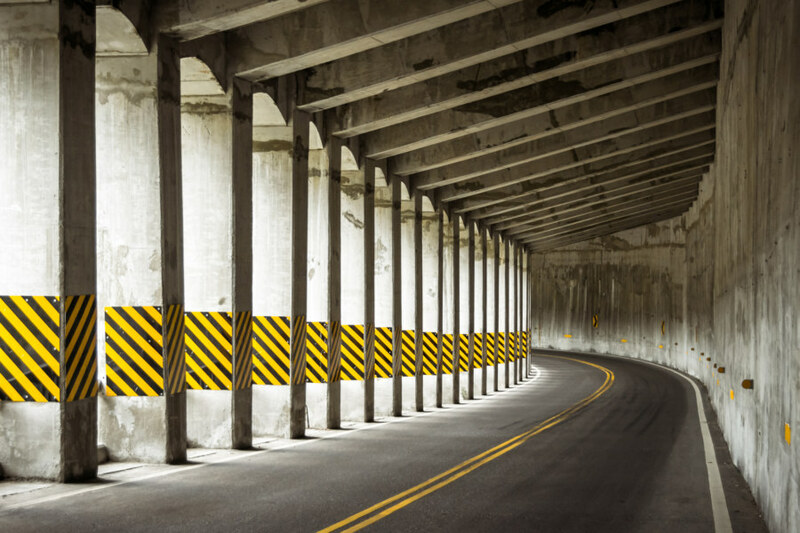 The long tunnel outside of Tianxiang. The works of man are dwarfed by the immensity of the gorge. Baiyang Waterfall vista in the very late afternoon. The bridge at the end of the Baiyang Waterfall Trail. The trail itself is deserving of its own post so I’ve only shared a select few photographs here (and if you’re interested in more information have a look here, here, or here). 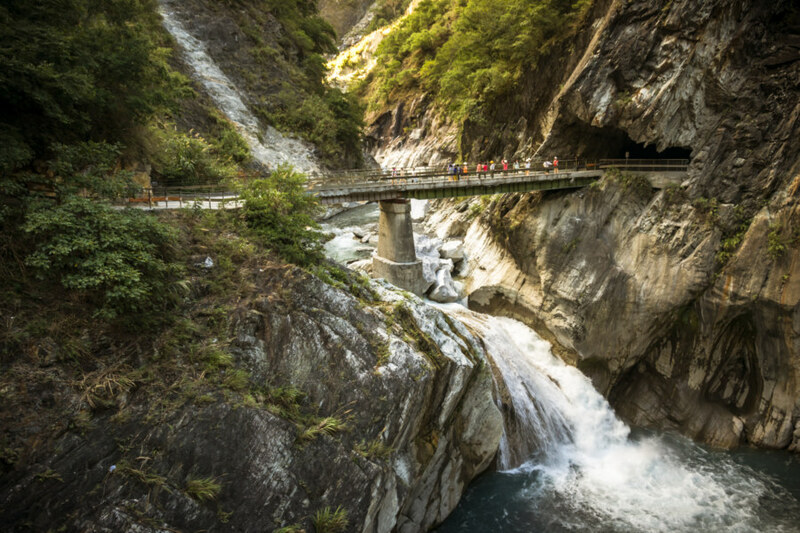 Suffice to say, it is one of the main attractions in Taroko Gorge and also one of the most accessible and easily explored trails in the lower part of the park. 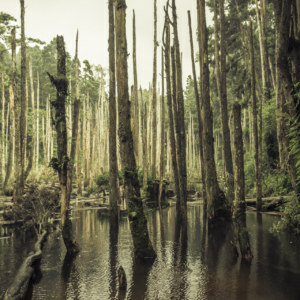 I had a rough time of it the previous year when walking it alone—but that was mainly because of all the emotional turmoil I had been going through at the time. To walk it again was therapeutic. I suppose I wouldn’t mind walking it again by now. Nine Lotus Mountain at the gates of Tianxiang the next day. Those clouds did not bode well for the day’s journey. On the morning of the 22nd I woke to check the weather report and read the news. The park was going to close around noon and the typhoon’s outer bands looked dangerously near the island, though there was not, as yet, any sign of rain on local radar. Rushing to get ready, I meant for us to stop at the amazingly beautiful Xiangde Temple 祥德寺 but the gates were already sealed. Taking one last photo by the bridge on the way into town we set out to race the oncoming typhoon over the central range. 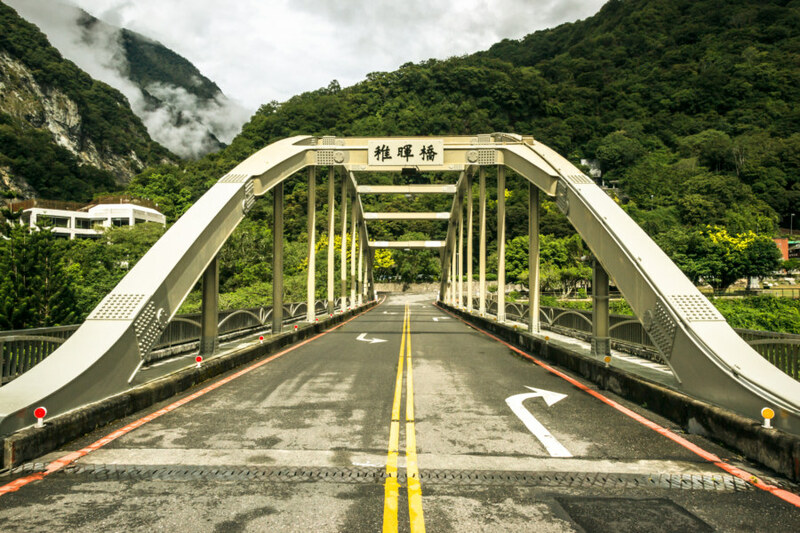 The temple was closed, probably due to the oncoming typhoon, so I shot this picture of the bridge into Tianxiang to mark the beginning of the long ride back over the mountains. This wasn’t a big deal on a scooter but imagine I was driving a tour bus? 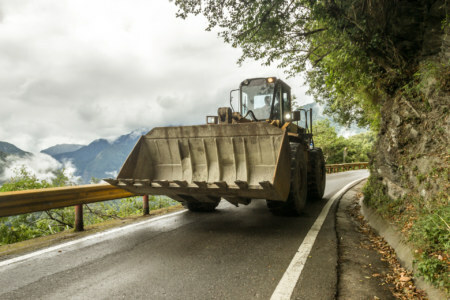 You have to have a lot of patience to drive something big through the gorge. The lack of traffic meant we made good time heading back into the mountains. It also made for an ominous ride. Moody clouds filled the marbled valley with the promise of rain where blue skies had welcomed us the day before. 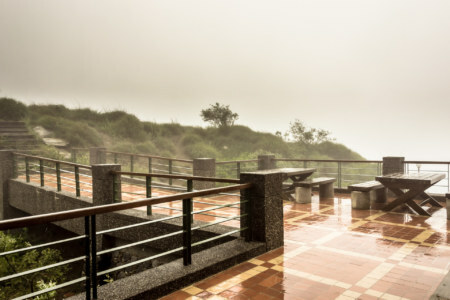 After a brief stop to use the facilities at Xīnbáiyáng 新白楊 (elevation 1,644 meters; more than a kilometer up from Tianxiang) it began to drizzle. The mountain chill was also starting to settle into our bones. Layers were added and the trunk of the scooter was inventoried. Only one raincoat—which meant I was going to get soaking wet and not be able to drive. It would be too cold for my companion to make it over Hehuanshan any other way. The rain starts coming down at Xinbaiyang. Howling winds and heavy rain high above the gorge. Switching roles, with me on the back of the scooter, we continued to ascend. 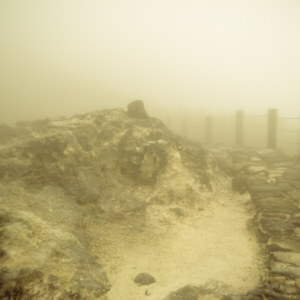 Soon we were in the thick of it, hard rain striking my bare legs like needles, as I was stupidly still wearing shorts. The wind began to pick up, gusting strong enough to push the scooter around on more exposed parts of the highway. I wasn’t able to see very much of what was happening as conditions continued to deteriorate. Rain blurred my vision and I was often forced to look to one side and shelter my face with my outstretched hand. Amazingly, we passed by someone on a bicycle partway through this madness, some lone wolf on a far more dangerous journey than our own. The forecast looked ominous when we stopped to rest at the small gas station on the way out of the gorge. 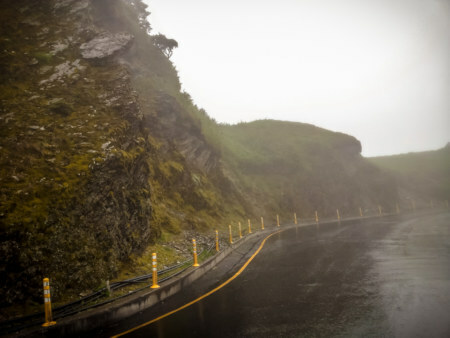 I didn’t get many photos from the ride back over Wuling because of dangerous weather conditions. We stopped for a break at the CPC gas station high in the park (2,374 meters). The facilities were rudimentary but I enjoyed warming up with black coffee from a machine while catching up with the weather report on television. It didn’t look so bad on the screen but conditions outside suggested otherwise. With no better idea and no interest in turning around we leapt back into the fray. On we went, scaling the island’s spine, battling fierce winds and incessant rain, eventually reaching the shelter of a vacant visitor’s center above the tree line for another break from the elements. 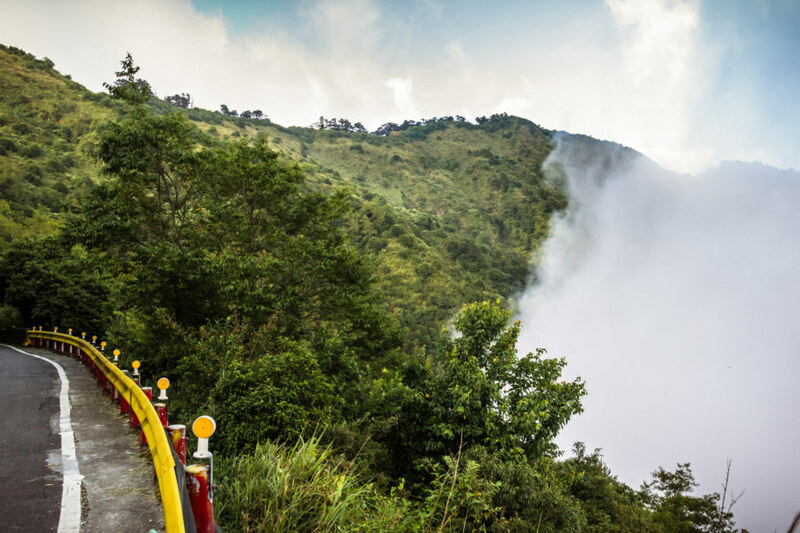 It was a scary ride on this final stretch up and over the high mountain pass. Back down in the relative safety of Qingjing Farm. Here the Chinese tour groups were going about their business as if nothing were happening on the other side of the mountains. 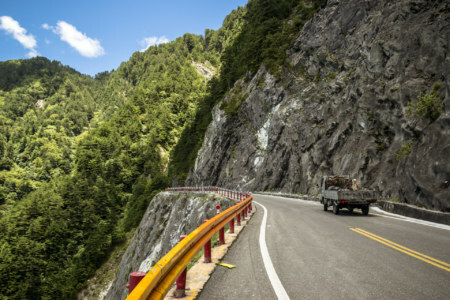 On the far side of Wuling conditions improved dramatically, reversing our fortunes. 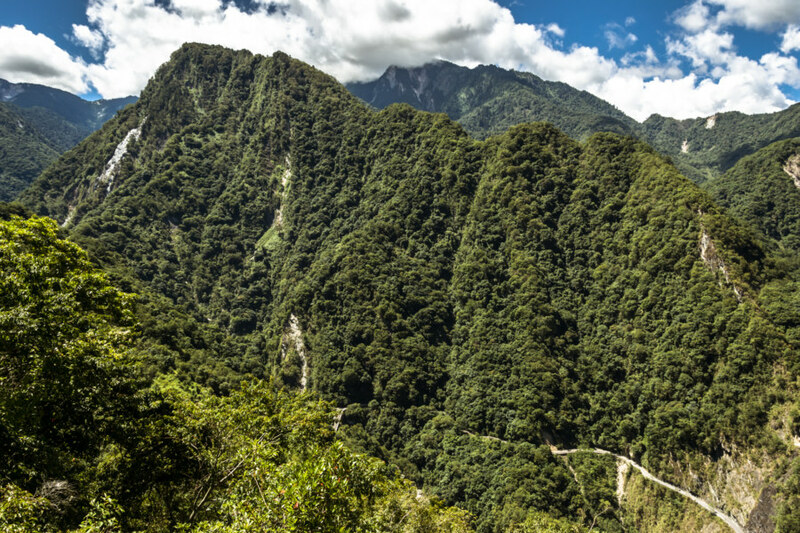 We had crossed a threshold, much as we had done on that first day as we rode up to Song Syue Lodge. We had passed back through the looking glass. Before long we were back under blue skies, albeit with some hazy high altitude clouds spreading across the eastern horizon. There was no more sign of the storm until we reached western Nantou again. 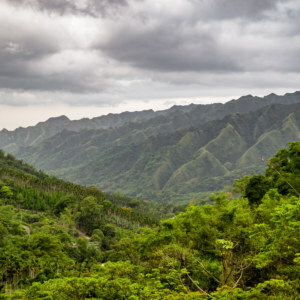 In hindsight I’m not entirely sure how much of the crazy weather we experienced was a direct result of the typhoon—or if things are normally like that at this time of year. From the weather maps I had been consulting it seemed like the storm was still offshore but perhaps the outer bands of the storm were running up against the central range. Whatever the case, it was a mad trip to take on a small scooter, and a welcome relief to come down the other side to the tourist zoo of Cingjing Farm still in full swing. Nobody seemed aware of the monster looming on the other side of the range. 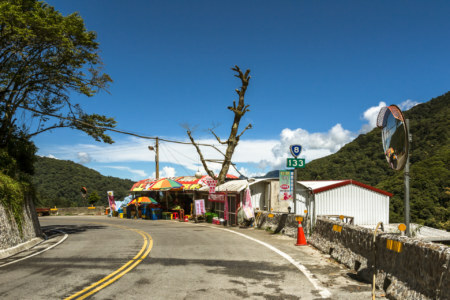 I thought of the cyclist we had seen on the ascent to Hehuanshan and hoped he made it to this side of the mountains unscathed. 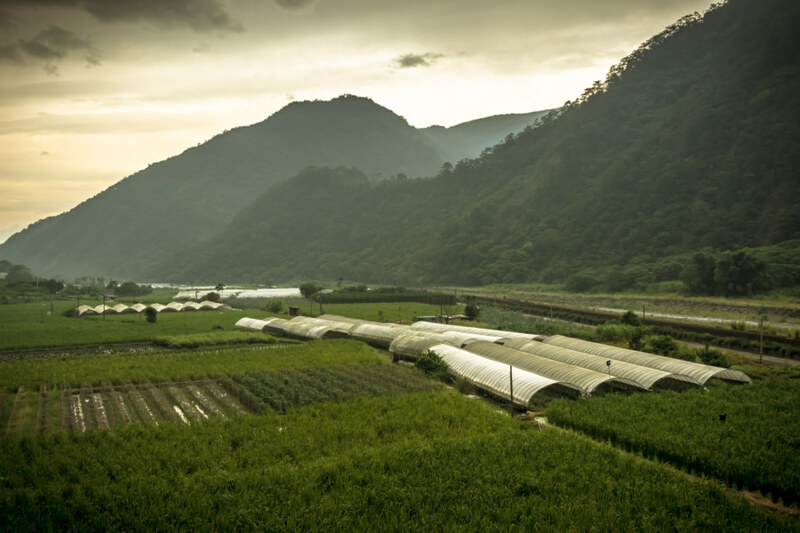 One last look at the farms of Nantou County while descending into Changhua. The rest of the trip back to Changhua was a race against time. The sun was setting and the storm was catching up with us the entire way. I would feel a hint of rain, twist the accelerator, and speed out of range time and again. Only on the descent from the far more modest Baguashan Range 八卦山脈 were we finally caught by the storm… but by then we had nearly arrived at our destination. That night, as the sun slipped below the horizon, the sky was pink. It was a most unusual sight, a harbinger of the onrushing storm, the kind of sunset you only see when a typhoon is about to strike. Such a memorable sight capped three days of riding and an unforgettable adventure crossing the highest mountain pass in the nation. No wonder I came back for more. Hi may I know how you get to the cloud of sea view area? Any guide to go there? Thanks!